This 4K webcam is the best webcam for streaming on the market. This 4K webcam also has stereo audio with dual mics. Logitech BRIO 4K STREAM Edition Webcam Best Streaming & Gaming Webcam. 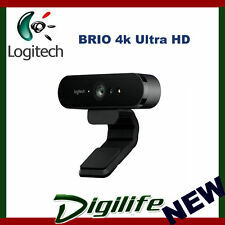 Logitech BRIO 4K STREAM Edition Webcam. Trending at AU $128.98eBay determines this price through a machine-learned model of the product's sale prices within the last 90 days. Logitech C922 Pro Stream Webcam Barely Used. Condition is Used. Purchased to take part in a work meeting. Used twice. Great chance to grab a bargain as they're hard to come by below $100. Tripod included. Download driver / software from Logitech website. Will be shipped with great care. Look great in any light with HDR and RightLight™ 3. Step up to the world’s most technologically advanced webcam and get professional-quality video for video conferencing, streaming, or recording. Whether in low light or bright sunshine, Logitech BRIO with RightLight™ 3 and high dynamic range (HDR) technology adjusts to highlight the most important subject: you. Manufacturer Logitech. Standard Warranty Claims Policy. DOA Warranty Claims Policy. Outside of this period, the item will be processed as a standard warranty case. The item is not used in any way. Logitech BRIO 4K Ultra HD Webcam HDR RightLight3 5xHD Zoom Auto Focus Infrared Sensor Video Conferencing Streaming Recording Windows Hello Security. 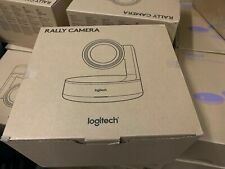 Logitech BRIO Webcam. 4K RECORDING. Infrared sensor technology for Windows Hello (SDK available for application integration). Step up to the world's most technologically advanced webcam and get professional-quality video for conference calls, streaming, or video recording. Manufacturer: Logitech. Product Family: BRIO. Product Line: BRIO. STREAM WEBCAM. Get fast, smooth uploads with H.264 – advanced compression technology that demands less network bandwidth. Fully adjustable tabletop tripod with swivel mount. Extends to 18.5cm. Stream clear video even in dim light. Get a closer look with 5x zoom. 5x digital zoom in Full HD. Get a closer look with 5x zoom. Whether in low light or bright sunshine, Logitech BRIO with RightLight 3 and high dynamic range (HDR) technology adjusts to highlight the most important subject: you. Equipped with HD autofocus and light correction, the C922 fine-tunes to the lighting conditions to produce razor-sharp high def images even if you’re in a dim setting. Lens technology: Full HD glass. Note: This order will be dispatched from our Sydney Warehouse. 1 x USB Cable - 1.8 m. Connectivity Technology: Wired. Interfaces: USB 2.0. Video Modes: 720/60p, 1080/30p. Manufacturer Logitech. Outside of this period, the item will be processed as a standard warranty case. quick links. Standard Warranty Claims Policy. DOA Warranty Claims Policy. Therefore, if you are not happy, we will persevere until you are 100% satisfied. Max Resolution: 1920 x 1080. Note: This order will be dispatched from our Sydney Warehouse. 1 x USB Cable - 1.8 m. Weight: 162 g.
C922 Pro Stream Webcam. Two omnidirectional mics ensure clear, no-drop streaming and recorded video.Tripod. Warranty There is a 12-month warranty on this product from the date of the receipt. Weight (Approximate). Logitech BRIO 4096 x 2160pixels USB 3.0 Black webcam A NEW BENCHMARK FOR WEBCAMS Step up to the world’s most technologically advanced webcam and get professional-quality video for conference calls, streaming, or video recording. Equipped with HD autofocus and light correction, the C922 fine-tunes to the lighting conditions to produce razor-sharp high def images even if you’re in a dim setting. FULL HIGH-DEF 1080P STREAMING. There are occasional chances that an order of the exact product may be placed minutes before yours. BRIGHTER IMAGES Equipped with HD autofocus and light correction, the C922 fine-tunes to the lighting conditions to produce razor-sharp high def images even if you’re in a dim setting. For more information, seehere andhere. LOGITECH 960-001105 NQR 26LT-CWC-BRIO-NQR ....d.
» Manufacturer Part Number: 960-001105 NQR. » Warranty » Cubic Weight (kg) » Actual Weight (kg): 0.512. » Category: USB WEB CAMS >. 5 out of 5 stars - LOGITECH 960-001105 NQR 26LT-CWC-BRIO-NQR ....d.
3 product ratings3 product ratings - LOGITECH 960-001105 NQR 26LT-CWC-BRIO-NQR ....d.
Step up to the worlds most technologically advanced webcam and get professional-quality video for conference calls, streaming, or video recording. Step up to the world’s most technologically advanced webcam and get professional-quality video for conference calls, streaming, or video recording. Trending at AU $248.28eBay determines this price through a machine-learned model of the product's sale prices within the last 90 days. Harsh lighting conditions?. Be your own producer. Step up to amazing face-to-face collaboration with Logitech BRIO, an unparalleled webcam experience. (960-001105). USB 2.0 port (USB 3.0 required for 4K) • TECHNICAL SPECIFICATIONS. NEW VILT-BRIO 960-001105, LOGITECH BRIO 4K ULTRA HD WEBCAM HDR RIGHTLIGHT3 .e. NEW VILT-BRIO 960-001105, LOGITECH BRIO 4K ULTRA HD WEBCAM HDR RIGHTLIGHT3 5XHD ZOOM AUTO FOCUS INFRARED SENSOR VIDEO CONFERENCING STREAMING RECORDING WINDOWS HELLO SECURITY. » Category: WEBCAM >. • 5x digital zoom in Full HD. 5 out of 5 stars - NEW VILT-BRIO 960-001105, LOGITECH BRIO 4K ULTRA HD WEBCAM HDR RIGHTLIGHT3 .e. 3 product ratings3 product ratings - NEW VILT-BRIO 960-001105, LOGITECH BRIO 4K ULTRA HD WEBCAM HDR RIGHTLIGHT3 .e. Get even closer with 5x digital zoom. Now you can record, stream, or take a conference call in any lighting condition – and always look great. Low light?. Bright sunshine?. No problem. 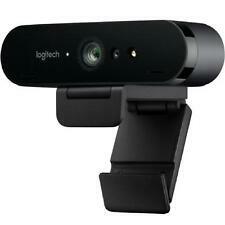 Logitech 4K Pro Webcam with RightLight. Logitech BRIO STREAM 4K Ultra HD Webcam for Video Chat, Conferencing, Recording and Streaming (for Windows & Mac). Experience face-to-face collaboration with Logitech BRIO a unparalleled webcam experience. 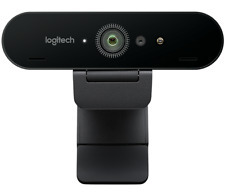 Logitech BRIO 4K Streaming Webcam. And impact as HDR shows you in more vivid and accurate colours, even in bad lighting conditions. Ultra HD 4K captures. Ultra HD 4K and HDR. Optimised for streaming. Trending at AU $326.67eBay determines this price through a machine-learned model of the product's sale prices within the last 90 days. Logitech BRIO 4K HDR and Redlight Professional Webcam Gaming Streaming Ultra HD. Great condition only used a few times. Comes with USB cable. 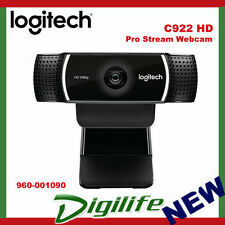 Logitech C922 Pro Stream HD Webcam - Black - (960-001087). Condition is New. Shipped with USPS Priority Mail. Logitech Brio Gaming Webcam 4K Streaming Edition HD Webcam 1080p Compatible With XBOX. Stream your gaming in crisp detail with the Logitech Brio Stream Edition 4K Ultra HD Webcam. This webcam records in 4k Ultra HD to capture fine details and accurate colours - perfect for showing off your new backdrop. Tech Data Product Data Sheet - Logitech BRIO STREAM(960-001194). Quick Start Guide - Logitech BRIO STREAM(960-001194). User Manual - Logitech BRIO STREAM(960-001194). Max Resolution4096 x 2160. Logitech BRIO STREAM. Manufacturer Warranty. Communications TechnologyBluetooth Low Energy (LE). Internet of Things (IoT). OS RequiredApple MacOS X 10.10 or later, Microsoft Windows 7 / 8.1 / 10. BatteryLithium Ion. Power DevicePower adapter - external. Dodatkowe informacje: Łatwa instalacja typu PLUG & PLAY. Kolor główny: Czarny. Interfejsy: USB 2.0. Mikrofon: TAK - Wbudowany. Głębokość: 85 mm. Funkcja aparatu cyfrowego: Nie. Its video calling credentials are impressive too, with razor-sharp images, smooth motion and natural colors. HDR shows you in more vivid and accurate colors, even in dim lighting. Interface USB 3.0. Get a closer look with 5x zoom. Step up to the world's most technologically advanced webcam and get professional-quality video for conference calls, streaming, or video recording. Whether in low light or bright sunshine, Logitech BRIO with RightLight 3 and high dynamic range (HDR) technology adjusts to highlight the most important subject: you.